RoHS (the Restriction of the Use of Certain Hazardous Substances) is a European Union directive which took effect on July 1st, 2006. It is intended to restrict the use of six substances which the European Union considers to be substantially harmful to the natural environment either through their production or their use. What exactly is the RoHS, and how does it affect electronics manufacturing? In essence, the RoHS prohibits the use of lead and lead based substances in the manufacture or sale of electronics within countries under the jurisdiction of the European Union. As for businesses established outside the EU, and which do not frequently operate or partner with businesses within the EU, many choose to adhere to these guidelines nevertheless to showcase their dedication to responsible and high-quality manufacture. WORLD is one such business. The reason why the manufacture of circuit boards and other electronic components was targeted by this directive is that traditional solder comprises 60% tin and 40% lead. For decades, manufacturers have used solder in the widest imaginable applications within engineering and electronics, and over time, this meant that a lot of lead had become waste in landfills across the globe. The toxicity of lead can harm local wildlife and even human populations, as lead moves up the food chain. The industry was initially resistant to these changes, especially because of an initial lack of a suitable alternative to lead-based solder, and reports that lead-free solder resulted in warping and delamination on PCBs, damage to Thru-Holes and increased moisture sensitivity. While every concern must be paid to the environment and the damage the ECM industry does, businesses and their clients must consider the reliability of the products they manufacture and sell. But as time has passed, and alternative solutions have been found, RoHS has been increasingly accepted as an industry standard. A new variety of solders have been introduced to the market that contains less or no lead, solder being the primary source of toxic metals and chemicals in a PCB. 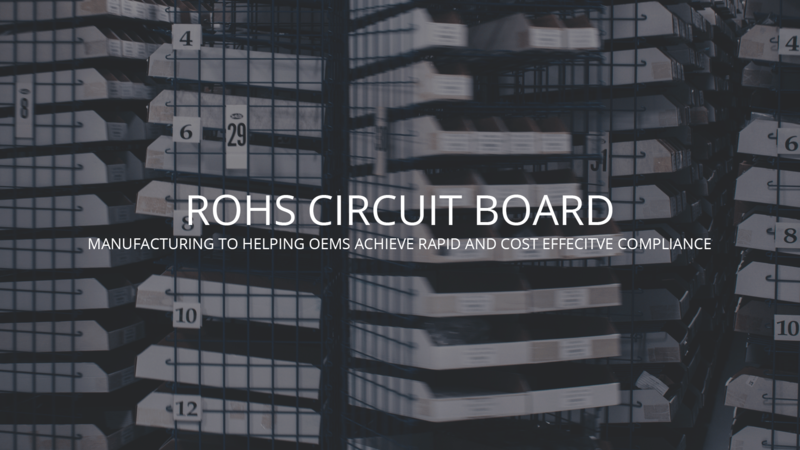 As such, businesses such as WORLD electronics now offer RoHS compliant PCBs for clients either concerned about the environmental impact their products might cause or for trade within the jurisdiction of the European Union. Lead has also been used extensively in a wide variety of applications such as the finishes, leads and connectors on circuit boards, PVC, paint, batteries and integrated circuits. As such, there are a wide number of components that must be checked and verified for a PCB to be certified RoHS compliant. WORLD circumvents this problem through our control of our supply chain, such that we can easily source components for a wide variety of assemblies which meet RoHS requirements. Does adhering to RoHS standards lower the standard of quality? RoHS is not a compromise. In fact, the solder and other lead-free components used can result in a better product lifespan. This is because of the toxicity of the lead, which can leach out from the solder and other components into the PCB itself, gradually weakening it over time. Research into lead-free alternatives to traditional solder was only reasonably successful at first, but today, mixtures that include copper, tin, and silver have been proven to be reliable as well as environmentally safe. The fact that a fit for purpose alternative to lead has been found has meant that an ever-increasing number of EMCs are choosing to embrace RoHS standards, both for environmental concerns and to trade within the European Union. After leveraging years of internal research into environmentally responsible circuit board manufacturing, WORLD electronics can help original equipment manufacturers (OEMs) achieve rapid and cost-effective compliance with global environmental protection initiatives, including the European Union’s (EU’s) Restriction of Hazardous Substances (RoHS) legislation, which requires the removal of several hazardous substances, including lead, from electronic components. We can help our customers re-design your non-compliant products and assemblies. We have separately established “green” manufacturing stations designated with “RoHS Assembly” signage, as well as a separate RoHS wave solder machine for efficient Thru-Hole (TH) assembly. RoHS BGA placement is a standard process. WORLD has been manufacturing RoHS assemblies since January 2006, even though the RoHS is not required by law for the manufacture of our products.